Is this the most dangerous backwater in the world? Across the world there has been a decline in piracy and sea robbery, but one precarious expanse of ocean waters in South East Asia is bucking that trend, as maritime defence expert Swee Lean Collin Koh explains. There was a time when news of pirates and kidnap-for-ransom dramas in the waters off Somalia dominated global news headlines. In 2011, at the height of the crisis, a total of 237 incidents were reported in the area. Since then, however, piracy has decreased significantly off the Horn of Africa, despite a recent attack against a Comoros-flagged tanker and one reported incident in the third quarter of last year. In Asia, there are reasons to be optimistic: reported piracy and sea robbery incidents, including cases of fuel-oil siphoning, have more than halved from 2015 to 2016, due to measures undertaken by both government agencies and shippers. But there is one small stretch of ocean waters in South East Asia that could potentially be one of the riskiest regions in the maritime world. Few people will have heard of it and it has barely hit the global headlines, compared to key waterways such as the Malacca Strait, but the Sulu-Celebes Sea, encompassing the waters around Indonesia, Malaysia's eastern Sabah state and the Philippines, has become an area of growing concern. Since March 2016, a spate of kidnap-for-ransom incidents have been reported there and in the waters off eastern Sabah. These attacks were attributed mainly to the Abu Sayyaf militant group operating out of the southern Philippines, although some appear to be criminal groups. What is worrying is their evolving modus operandi. They initially targeted slow-moving, low-freeboard vessels such as tugboats (typically towing barges laden with coal bound from Indonesia to the southern Philippines) and fishing trawlers. But they have since become more brazen, making attempts on larger ships in the area. Notably, a South Korean-flagged heavy-load carrier was attacked in southern Philippine waters in October 2016. Indonesia, Malaysia and the Philippines have held a series of high-level meetings and issued joint statements envisaging the creation of something called a Trilateral Co-operative Arrangement (TCA). A four-point action plan was agreed between the three countries' foreign ministers back in May 2016, but progress has not been as swift as some might have expected, even though a model exists in the form of joint co-ordinated patrols in the Malacca Strait. Jakarta initiated this proposal and has eagerly pushed for the TCA's implementation, given that many of the kidnap-for-ransom victims are Indonesians. But frustration within the Indonesian government at the slow progress led to it imposing a moratorium on coal shipments to the Philippines, to be extended "until there is a guarantee for security from the Philippine government". The two countries later forged an agreement - based on a 1975 border pact - which allows Indonesian forces to conduct "hot pursuit" into Philippine territory. Successive joint statements continued to agree to explore measures such as co-ordinated patrols and a safe vessel transit corridor through the Sulu-Celebes Sea. The growing threat posed by the Islamic State hastened moves by the three countries including, notably, an agreement to establish command posts in Bongao in the Philippines, Tawau in Malaysia and Tarakan in Indonesia. Stop-gap measures were put in place while the three nations worked with their domestic institutions on a deal. For example, Jakarta and Manila formalised co-ordinated patrols to take place twice a year. Following a spate of attacks on East Malaysia-registered fishing boats crewed by Indonesians late last year, Jakarta sought assurances from the Sabah local authorities regarding the safety of roughly 6,000 Indonesian fishing crew working in Malaysian waters. Philippine President Rodrigo Duterte also chimed in, appearing to hint at his frustration about the slow progress in the TCA when he remarked "Malaysia, Indonesia and the Philippines [must] talk about this and once for all, come up with a solution". "There's a need for us… to talk about this seriously and to put a stop to it because it has somehow paralysed the trade and commerce in that area," he added. International shippers have shied away from the Autonomous Region in Muslim Mindanao because of the attacks, denying the Philippine region much-needed foreign investment. 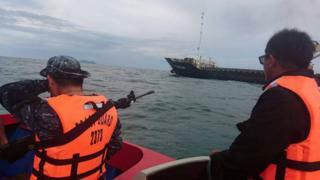 In December, Malaysian security forces clashed for the first time with Filipino gunmen in waters off Semporna, killing three of them and capturing three others. This seems to have had an effect. Late that month, Kuala Lumpur revealed that it was in final talks with Jakarta and Manila on implementing the TCA. But a spate of new attacks this year - on a Sabah-registered fishing vessel and a Vietnamese vessel - highlighted the urgent need to go beyond mere talks. Manila has asked both China and the United States to contribute to maritime security in international waters in the area. And in March, Indonesia, Malaysia and the Philippines finally agreed to begin patrolling the proposed transit corridor. Shippers could heave a sigh of relief, at last. However, successfully carrying out this trilateral maritime security framework will require all three governments to sustain their commitments, including the need to put aside political concerns - such as the question of sovereignty between Kuala Lumpur and Manila over Sabah, since Mr Duterte has insisted that his administration "will stick to our claim". If the TCA succeeds, Indonesia, Malaysia and the Philippines would not only prove to the international community that the Sulu-Celebes Sea is not a "new Somalia", but also demonstrate their ability to put aside political and diplomatic concerns to pool their efforts to deal with a common threat. Swee Lean Collin Koh is a research fellow with the Maritime Security Programme at the Institute of Defence and Strategic Studies, part of the S Rajaratnam School of International Studies, Nanyang Technological University, based in Singapore.